We're approaching the end of the year, and there are but three reviews of 2017 left. Let's crank the first one out immediately, as there's no time to waste! Here's SuperPhillip Central's review of The Legend of Zelda-inspired Blossom Tales: The Sleeping King. It's an often-used phrase that "imitation is the sincerest form of flattery." No doubt that The Legend of Zelda series is a historic and revolutionary one that many developers AAA, indie, and in between have been inspired by the games, oftentimes coming up with their own -- for a lack of a better term -- "interpretations" of the formula. That's what seems to be the case with the recently released Blossom Tales: The Sleeping King from publisher FDG Entertainment. 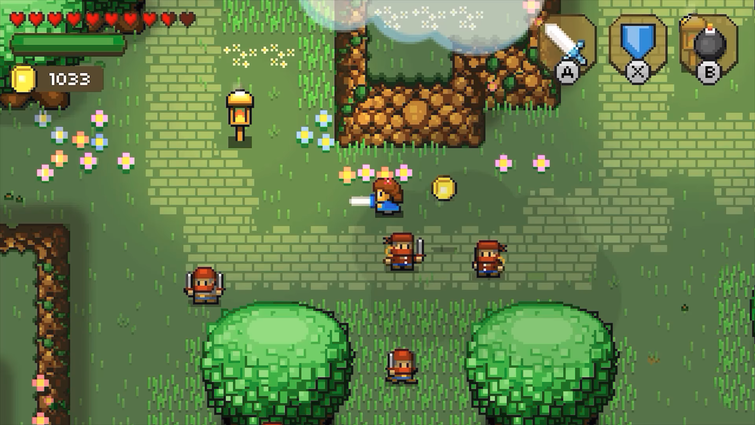 Nevertheless, is there more to this take on 2D Zelda than meets the eye? Well, yes, in many regards. Right away, the implementation of the story is done cleverly, seeing two young, restless kids pestering their grandpa for a bedtime story. He happily obliges and tells the tale of a girl named Lily who wakes up from her bed within the kingdom and hightails it to a castle ceremony where she becomes a knight. Soon, the king's nefarious, wizard brother uses a spell to put him to sleep while preparing an assault on the castle, yearning to take the kingdom of Blossom over for himself and his own greedy, selfish ambitions. Only through acquiring three unique ingredients can the king wake up from his comatose state. His Majesty is quite the prognosticator! Especially with his brother Crocus by his side! While the plot is nothing magical or even noteworthy as it's rather standard fare, what makes the story of Blossom Tales so interesting and entertaining is the interactions between the grandpa and his two grandchildren. The grandpa generally sets up each new location Lily reaches, while the grandchildren usually interrupt with their own thoughts on how things are progressing. Sure, this can sometimes effect the pacing of the game negatively, but it seldom becomes too big of a deal. The most creative way the grandpa and grandkids' dialog is inserted into the game occurs at a specific points within Lily's adventure. There are times where the grandchildren will get bored of a given result or challenge, and they plead to their grandpa to spruce things up. These points in the story allow the player to choose from a duo of offerings, such as whether Lily goes up against a group of bandits or an army of archers. Other instances within the story are affected as well, some not even part of the standard plot, in out-of-the-way locations like caverns. Whether holding one sword or two, these bandits will be sorry to have messed with Lily. Lily herself controls as well as any fan of Zelda games would expect. She comes equipped with a sword, and holding the A button (where the sword is always equipped) for a short length of time will result in a roundhouse blade attack, similar to Link's spinning slash in the Zelda series. Upon her adventure, Lily comes across a wide array of inventory items, such as a bow and arrow, bombs, a boomerang, and more. These can be equipped to two other face buttons, though it's disappointing that the developer didn't bother to use more of the buttons that were available to them on the Switch controller or PC keyboard. Having only two item slots means you're constantly changing them within the item menu Link's Awakening-style. The only difference here is that by virtue of being on a button-limited system like Link's Awakening was, that game had to make do with only two buttons for inventory spaces while Blossom Tales does not. Instead, the developers chose to only include two inventory spaces at one time, resulting in a lot of micro-management of items. This is obnoxious in later dungeons where a wide variety of items are needed to progress, meaning lots of item-switching via the inventory menu. 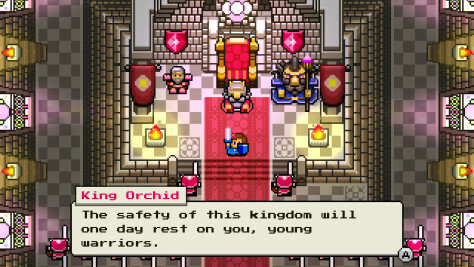 Like many games inspired by the most popular 2D Legend of Zelda titles, Blossom Tales apes a lot from its inspiration. Maybe too much so. From aforementioned mainstay items from Zelda like bows, bombs, and boomerangs, enemy and obstacle-laden dungeons filled with familiar puzzles from 2D Zeldas such as an Oracle of Ages-styled "move across all tiles without touching previously walked upon tiles" (these appear way too much, by the way), the requirement to find four pieces of heart to add a new heart to your life (or more magic to your magic meter in the case of mana boosts), and so forth, I think you can get the idea that Blossom Tales strays closely in its interpretation of The Legend of Zelda series. Some puzzles are simple, while others can perplex. 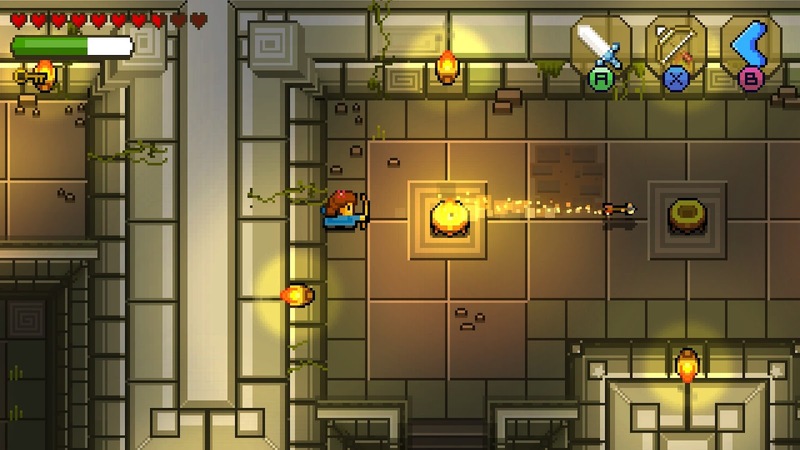 That said, while Blossom Tales is a love letter to old school Zelda games, it does take some ideas from more modern games. For instance, a meter is used that empties some each time a consumable item such as a bomb or arrow is used instead of having a limited number of an item, resulting in having to scrounge through slicing up bushes and grass for extra bombs and arrows. This meter replenishes a bit after a short time, much like the recent 3DS Zelda game, A Link Between Worlds. Again, if you're going to gather and grow inspiration from some game, why not one of the best? Each time Lily uses her bow, bombs, or boomerang, her magic meter empties some. Don't worry, though -- it replenishes over time! 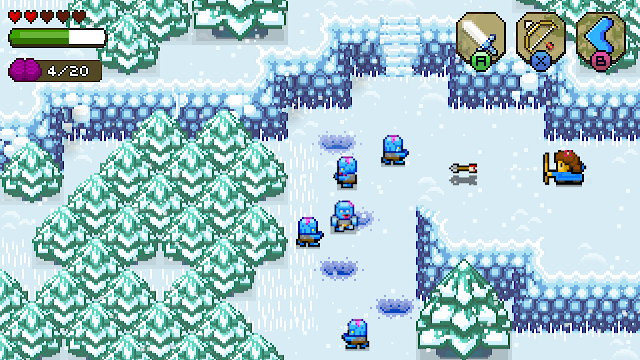 Blossom Tales uses a blocky graphical style featuring aspects of its presentation not possible at the time its inspirations were made, such as having an enemy horde of dozens pop up in a room without a sign of slow-down in the frame-rate. Yes, these ambush rooms are obnoxious, but it's still cool to see. The environments are richly detailed and feature some really cool weather effects, and the sound package is serviceable, if not that memorable from my own experience playing the game. 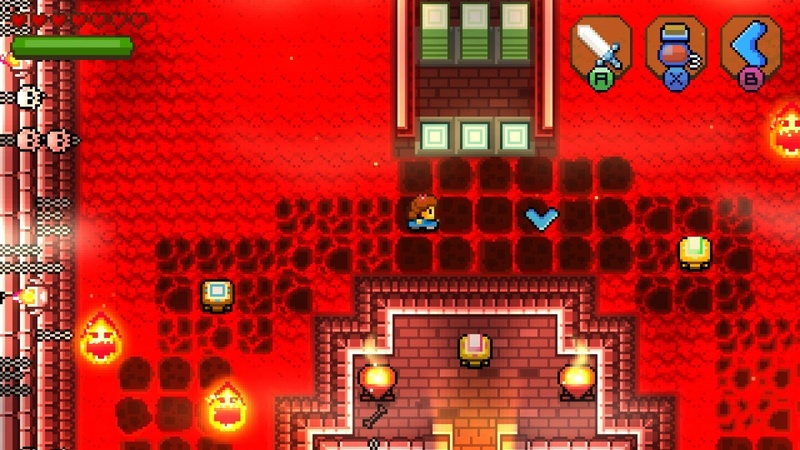 Any good dungeon is filled with danger, and Blossom Tales doesn't disappoint in this department. Those looking for a new 2D Zelda game while they wait for an official new 2D Zelda game can easily check out and be satisfied by FDG Entertainment's Blossom Tales: The Sleeping King. It may not do too much to push the creative envelope all that much, but it does supply the player with a thoughtfully designed adventure with plenty of enemies to encounter, areas to explore, and treasure to plunder, all while on you and Lily's way of saving the king and the kingdom itself. Review copy provided by FDG Entertainment.